You can find introductory/tutorial material through the respective web sites. P.A. Burrough and R.A. McDonnell, Principles of Geographic Information Systems. Oxford University Press. Chapter 5 and 6. The first two books can be borrowed without asking (but please leave a note), and should otherwise be on my desk at RvE, 5th floor. The EU has set two PM10 (particulates, particulate matter, Feinstaub) limits: (a) find out which, (b) how do these limits change on 01.01.2010?, (c) are these limits obtained by linear aggregation or by non-linear aggregation over single (e.g. 10 minute) measured values. 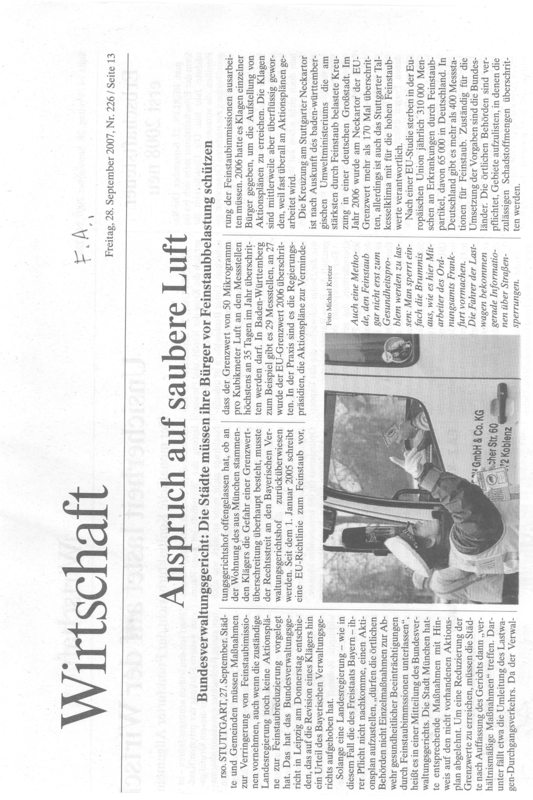 Why does the Frankfurter Algemeine article only mention one of the two limits? 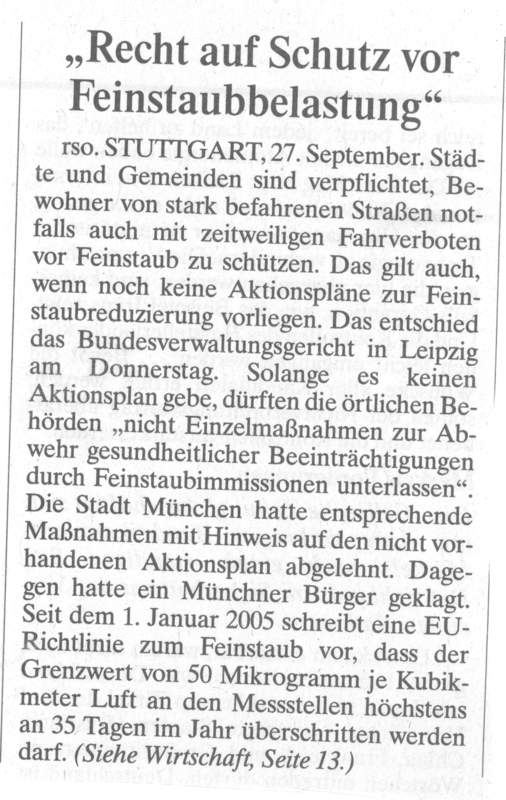 How can the Bayerische Verwaltungsgerichthof find out whether the EU limit is exceeded for the house of the person who started this case? For 27 out of 29 the BW monitoring stations the limit was exceeded. Can we conclude that in 93% of Baden-Württemberg the PM10 limit is exceeded? Where can we find the PM measurements for all of Europe? How can local authorities list the areas where a limit is exceeded? Before permission is given to build e.g. roads or buildings, one has to prove that it will not result in the exceedence of a PM limit. How would you do this? On 23.10.07, 12-14h: go through the first 6 chapters (up to "lists and data frames") of An Introduction to R: go to the R home page, click Manuals under Documentation, and open the Introduction. You can copy and paste commands to an R session, started in the CIP pool. 30.10.07 course material: finish the R introductory material, then go carefully through these exercises (html, pdf). 20.11.07: go through section 6 of the course. If you don't finish it, do it at home, before 27.11.07 (when we will discuss the exercises). 27.11.07: go through section 7 and 8 of the course. If you don't finish it, do it at home, before 4.12.07 (when we will discuss the exercises). If you get stuck somewhere, let me know. 4.12.07: you'll find more and new exercises. Try them! 11.12.07: we'll go through older exercises. A test is planned on 30 Jan 2007, 10:00-12:00, and will cover the material treated in the lectures and exercises. The questions will not be of the kind "how do I do this with R", but rather refer to the modelling itself. The assignment will be a written report of max 5 pages (regular fonts/margins/page size, including figures and/or tables) on a modelling exercise you set up yourself. It should include an introduction, a central research question, a description of the data, a description of the analysis and the results, and concluding remarks answering the central research question. It is allowed to do the research in couples, but the written report should be made individual. It should be handed in the latest two weeks before end of Semester Ferien (exact date/time will follow). German is allowed, English is encouraged. The final mark will be computed from both exercise and test (equally weighted, but both need to be passed).